Binary Scam Alerts » Scam Brokers » Finpari Review, SCAM Finpari Broker Or Legit? Until recently Finpari was one of a handful of binary options brokers accepting US traders, however, as we will show in our detailed Finpari scam broker review and investigation things are not as they seem. Finpari is owned by Lerona Impex SA, which is located at 306 Premier Building, Albert Street, Victoria Mahe, Seychelles and Norske Inter LP located at 39 Due Street, Suite 1, Aberdeen, Scotland, AB11 6DY. They also have two phone numbers the one for US traders is (646) 884-9563 and there is also a number in Russia which is +7 499 703 3774. Their advertised email address is [email protected]. It appears Finpari has been around for quite a while and at the time was considered to be a leading binary options broker. As we will show, there is a reason they were around for a while. Keep reading to see if this broker should be blacklisted or if they are legit. Finpari is a Spotoption-powered broker and offers a “unique” trading environment according to their sales page. In reality, we are looking at a standard (and maybe a bit enhanced) broker setup with the usual platform. Interestingly enough one of the first things we see is follow the leader or “copy trading”. We will soon explain why we believe trading binary high/low is preferred in our opinion. Besides that they offer the usual Pairs, Long Term Options, Short Term Options, Sixty Seconds, One Touch, and as mentioned previously “follow me”. 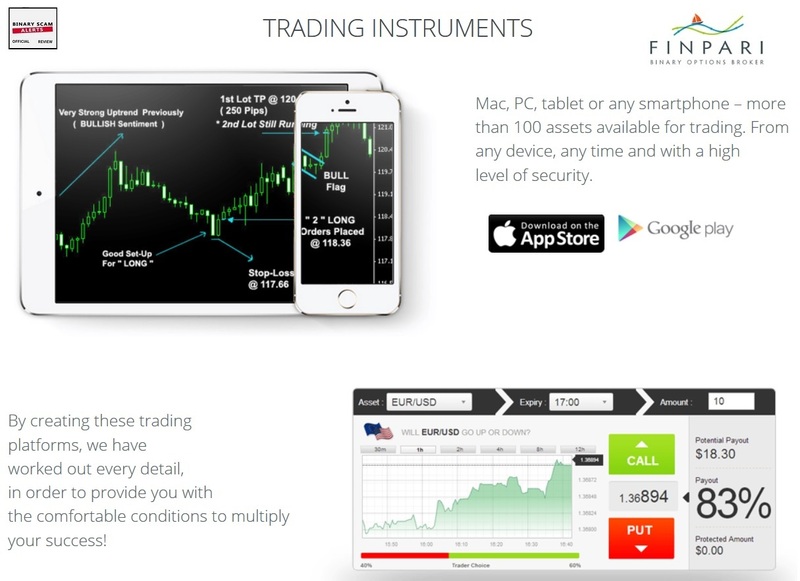 Trading is also available on Android and IOS as well as other mobile devices and smart phones. Assets Include Currencies, Stock, Indices, and Commodities. EUR/USD, GBP/USD, USD/JPY, USD/CAD, EUR/JPY, USD/CHF, AUD/USD, BITCOIN/USD, EUR/GBP, BITCOIN/USD. IBM, Coca Cola, Nike, British Petroleum, Apple, Microsoft, Amazon, Intel, and Walmart. S&P 500, DAX, FTSE, TADAWUL, Hang Seng, IBEX, Nifty, and Nasdaq. The diagram below is a screenshot taken from their bonus module, and is is presented as an “advantage”. Accepting a bonus from Finpari or from any other broker carries a certain level of risk since you are required to trade a certain number of times in order to qualify to cash out your winnings. In general we recommend against it, however if you need a little push in your balance feel free to accept a small bonus (not more than 10%). It’s also interesting they advertise they have a 1 hour withdrawal policy, this is something which is unheard of in the industry. We don’t know if it’s real or just a ploy to get you motivated, but we have not heard about any complaints about cashing out so even if it is a bit hyped up as long as they payout we feel its OK. This is the classic archive of videos and explanatory information about the various trading options such as options builder and 60 second options. There’s nothing out of the ordinary but it can be very useful when browsing the Finpari website looking for trading tips. There are various tactics which brokers use to defraud innocent and unsuspecting victims. First and most troubling is overcharging, which is outright theft and credit card fraud. For the sake of honesty we have to state that this is one complaint from a serial cry-baby which has not been substantiated or confirmed with proof. So based on our previous experience we are not taking it very seriously . The second and most prevalent complaint with brokers has to do with withholding or declining withdrawal requests AFTER all documentation has been submitted. Finpari is in the clear here again, as his has been confirmed and verified from 7 different traders. 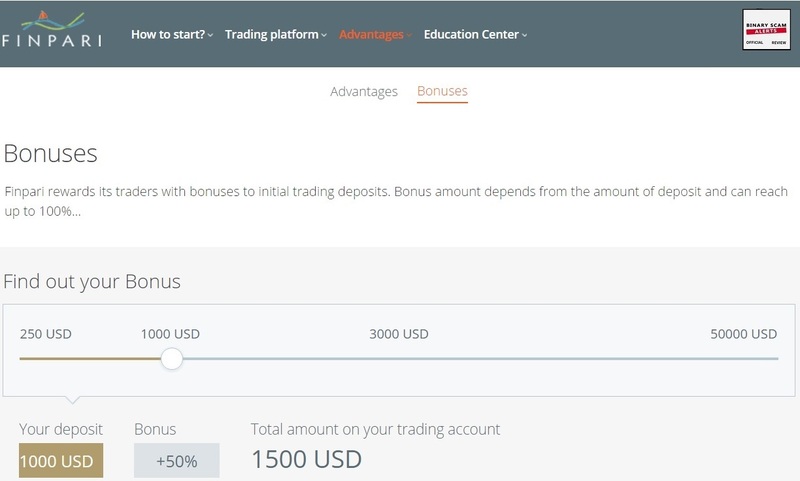 The third most common complaint has to do with forcing bonuses in order to create trading requirements and disqualify traders from making withdrawals. This is particularly evident with traders who have large account balances that can be cashed out. We could not find any wrong doing here as well, so we have to give them our seal of approval. We have to admit that when hearing grievances our hearts go out to these poor folks and we were not able to stand idle and see them suffer. We actually made a small contribution to an old lady from Wisconsin who is suffering from a deteriorating heart condition and lives on a small pension and social security without any help from relatives. She was scammed by another broker named Bigoption. You always have people complaining, especially after they lose. We have a robust “report a scam” section and have not received any serious complaints that can be backed up with facts. Finpari is not a regulated broker, however we have seen regulated brokers that steal money while unregulated ones play fair. We have seen Finpary act in a responsible way towards their customers and responding with care and concern. You are able to see all your trading history in your dashboard. We found communication to be both courteous as well as unprofessional. The level of English was acceptable and it’s obvious to see we are not dealing with native English speakers, but that does not necessarily mean something is fishy. In fact, many respectable financial institutions hire people with a foreign accent and they do a good job. It’s worth pointing out that it has been publicized that these types of operations may at times be a part of a bigger scheme which is used to launder money originating from other crimes committed elsewhere. We have reason to believe this is not the case with Finpari and evidence proving this could not be produced, so as far as we are concerned they are legit. Finpari is a SCAM-Free broker and while we implore you to use your common sense before investing, this is actually one of the cases where you can do so calmly. If you choose to deposit and fund a trading account you will most likely receive a phone call or be contacted by an investment consultant or analyst. It’s worth while listening to what they have to say and keep a good relationship since you will need it in order to cash out your winnings.As always, we recommend using a prepaid credit card or ewalletjust to be on the safe side, and we know these are accepted by Finpari. In short, you could do far worst with another broker so you might as well test the waters and see what its about. As always, don’t forget to join our Facebook Page and YouTube channel and get informed.